Turn on your TV or scroll through your Facebook feed and you’ll come across some new at-home gimmick that promises a pain-free, low-cost remedy to those crooked teeth that you never thought you could afford to straighten. These services offer various iterations of the same concept , which all promise a perfect smile with little effort. They appeal to the masses because at first glance the price is lower than the quote for braces they got for their kids and they’re told it only takes a few iPhone pictures and voila, the magical trays appear on your doorstep and you only need to follow the tray schedule. While this may seem like an easy option, maybe even less expensive, I have to caution you as to the safety and efficacy of this process. It works by you taking your own impressions, snap a few photos of the inside and outside of your mouth and submit them to the company who then prescribes a course of treatment that lasts, according to their claims, an average of 20 weeks. This is a treatment plan that is unsupervised by dental professional. But if you like the end result, that’s the barometer of success, right? It’s not so simple. First, these insta-smile companies don’t and can’t account for potential land mines such a lurking decay in your teeth, gum disease that could potentially cause you to lose your teeth, where your teeth are in the jawbone and how that could be adversely affected by even the slightest misalignment. I’ve even heard of patients who have lost their healthy teeth because the treatment moved their teeth outside of what was otherwise a normal, healthy bone! One of my patients came to me after starting this at-home service, and she was frustrated by trays that didn’t fit, kept rubbing her tongue raw and the company’s solution was for her to simply take 20 more photos of how the trays were improperly fitted under her tongue. Suffice to say, a smartphone camera wasn’t designed to take photos in your mouth. At our office, we provide Invisalign to cases that I hand select and I personally supervise the entire course of treatment from beginning to end. I’m a firm believer in Invisalign because it enhances the treatment process in several ways that at-home packages do not. First, it uses precise attachments that are bonded on to your teeth which provides more optimal movement of each individual tooth at a healthy and predictable pace. Second, the process can be amended based on the performance of teeth movement and whether they are tracking according to the original treatment plan. If a tooth goes off-plan (which they can often do) Invisalign allows for easier remediation with little impact to the original plan and there is no added cost to my patient. Plus, you’re not cramming a smartphone camera in your mouth hoping the picture isn’t blurred by pieces of that day’s lunch. I don’t want a fake tooth!! Whew! We’re explaining a lot today so hold tight!! When you’re missing a tooth, you have many options to replace it. One option is to leave the space as is. The downside to this, besides cosmetic concerns, is that adjacent teeth will move into this side… Usually by tilting into the space, which can mess up your bite. Also, the opposing tooth likes to have something touching it when you bite, so that tooth will appear to “stretch” into that hole, compromising that tooth as well! A second option is a denture. A denture can come in two forms, replacing all of your teeth in one arch (upper or lower) is called a full denture. A full denture relies only on the soft tissue and muscles to hold it in place. An upper full denture uses the palate to form a seal and can have much better retention than the lower. The lower full denture sits on top of the ridge and usually moves quite a bit with tongue movement… Think, eating or talking. A denture replacing one or a few teeth is called a partial denture. A temporary partial denture is commonly called a flipper… Not the dolphin!! A partial denture relies on the adjacent teeth to hold it in place using clasps for retention. Most all dentures, full or partial, have to be removed for 6-8 hours a day, recommended while sleeping, to let the gum tissue rest and recover. (Think shriveled fingers after a day of swimming!) Full or partial dentures can also get added retention by attaching them to dental implants. A third option is a bridge. A bridge is a multiple-unit crown that attaches on one or both sides to natural teeth or implants. (Dr Macalik doesn’t recommend attaching bridges using both implants and teeth in one bridge). A bridge attached on one side is called a cantilever bridge and is only recommended in certain instances. The downside of using a bridge to replace a missing space is that at least one tooth, usually two, have to be reduced in size for the bridge to be placed. The average lifespan of a bridge is 3-5 years due to the connected teeth not being properly cleaned and developing decay under the bridge. A cantilever acts just as that: a lever, which can add additional forces to the tooth which can compromise it’s bone support. The best option, if you’re a candidate for it, is an implant. An implant is an artificial tooth root that goes into the bone and fuses to the surrounding bone. It forms, fits, feels, functions, and flosses just like a natural tooth. When the implant is ready to be restored (after it’s healed), an impression is taken to make a custom fit connector (abutment) and a crown. As the implant is healing there are two temporary options used solely for cosmetic reasons: a temporary abutment or a flipper. A flipper, as we mentioned earlier, is a removable partial denture used to replace missing teeth temporarily. A temporary abutment is actually attached to the implant, but not put in function to reduce the strain and stress on the implant while healing. There are lots of factors that come into play when considering which option is right for you. Dr Macalik firmly believes you should be fully informed about all your options. Please call today if you have more questions or to set up a consult to figure out what’s right for you!! “Where is Moldova?”. If you’re like most Westerners, this is first thing you ask. Moldova is in Eastern Europe, a former Soviet Republic who gained their independence in August 1991, as a result of dissolution of the USSR. It is a small country, squeezed between it’s more well-known and former Soviet brethren, Romania and Ukraine. Per capita, it’s the poorest country in all of Europe and on top of that designation, a majority of working age men and women emigrate to other European countries for a decent shot at gainful employment and send their earnings home. They will work for about nine continuous months and then go return home for a month to see their families. Enter Serving Him; Serving Him is a fantastic non-profit agency that helps set-up and support dental and medical clinics in three different countries, the newest of which is Moldova. Their clinic in Moldova had its grand opening just last year, in the Fall of 2015. My dear colleague, Dr. Tom Whinery is now the country lead for the clinic in Moldova, which means he’s in charge of recruiting and supporting the teams that go on trips to the clinic. He helps to recruit dentists, doctors and lay-people to dedicate a week of their time and talents to serving this impoverished country, with the aim of scheduling multiple trips per year. The doctors and dentists work feverishly all week seeing as many people and patients as they can for four days, while the lay-people get to talk to people as they are in the waiting room as well as just keeping them company. The dental and medical clinic—which are housed inside the local church—is operational year-round and staffed by a small staff as well as with a resident dentist. And while local patients will still encounter a small fee to see a dentist at the clinic, it’s still much less than visiting a local dental office. The clinic genuinely cares about the local people and wants to ensure cost is never a reason to turn away someone in need of care.. All the patients that are seen while the visiting doctors are in town are not just from the capital city of Chisinau, but also from the neighboring, small villages, some of which will never have access to a local dentist, except for this unique dental ministry. The church’s ultimate aim is to share the Gospel of Jesus with anyone who comes through the clinic. All other benefits, whether they be medical, dental or provisional are a side-note to the aim of ensuring that their ultimate spiritual needs are addressed. Dr Whinery recruited Dr. Macalik to join him in entering into this impoverished context in the Summer of 2015 and she didn’t think twice about wanting to deploy her skills to help those that may otherwise never get the chance for affordable dental care. She has made serving a central theme of her dental career and considers it an honor to hone the skills God has given her in order to serve those most in need. With this being her sixth mission trip and with having an actual roof to work under, complete with 2 assistants (her prior trips usually involved working under a shade tree), the people of Moldova were genuinely appreciative of her care, and the dental clinic was more modern than any other clinic that she’s worked in before. Please pray for those she’s yet to encounter and that she would be given wisdom on which peoples would be most benefited by her excellent care for her next dental mission trip. 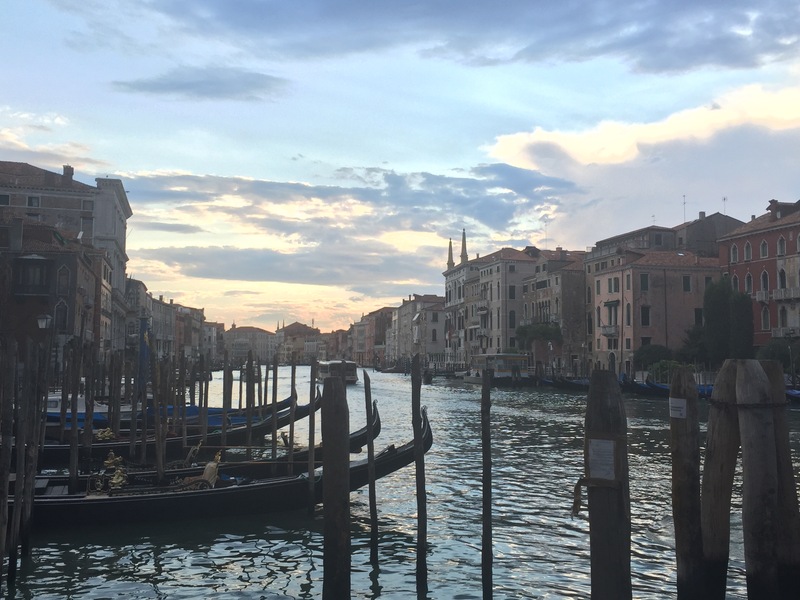 Italy marked my 22nd country, and although I just visited Venice… I absolutely loved it! Read below for my trip highlights and details and do’s and dont’s. Marco Polo airport is on the mainland, and Venice is a fish-shaped island. When you land at the airport, you take either a boat ($$$), a train to a vaporetto, or a bus to a vaporetto. I took the #5 bus, to Piazzale Roma (station), and jumped off to the vaporetto (they call them water buses). You can buy an unlimited pass (like 24 hours or 72 hours) at the airport, which, depending on how long you’re there, can be worth it in all the wrong steps you will take getting on the wrong dock for vaporettoes! A one way bus ticket and one way vaporetto cost me 15€. (I read something about how it’s supposed to last 75 minutes, but after jumping on the wrong boat and off, I don’t think that worked for unlimited in that time!) One of the must-see sights is a Grand canal ride, which is cheapest and just as nice to do in the vaporetto. I stayed at the Hotel Rialto, which is right next to the Rialto bridge, which is also a “must-see” sight. (It was under construction and not so great while I was there, but the hotel is conveniently located almost In the middle of the “fish” island. Highly recommend, even though rooms are pretty small, and decor looked dated like something out of the 15th century, there’s free breakfast and wifi, which you just can’t beat, and the not-so-common air conditioning!!) Another “sight to see”, especially if you’re a foodie, is the Rialto Market, which is caddy-corner from the Rialto hotel, across the bridge, but I think it’s closed Sunday and Monday which were the days I was there, so I don’t know anything about it. Another plus to the Rialto hotel is that it’s easy to find off the vaporetto… You can literally see it from the boat. To get to Rialto area, take either the #1 or 2 vaporetto; #1 has a lot more stops and you have to carry your luggage over a bridge with steps, and #2 is right outside the door of the Rialto… Take the #2! To get around Venice seemed tricky at first. I’m glad I arrived during the day! There aren’t a lot of maps that have all the street signs; Google maps or Gps are useless bc a lot of streets go under bridges, seemingly through buildings… I got a really good map from the lobby of hotel Rialto that had most street signs in the main areas. (That I didn’t have to pay for). One of the other “have-to-do’s” is to get lost in Venice. Trust me, this is easy to do!! But the island isn’t that large and you can’t really get that lost, so don’t worry!! It really does feel like a maze though!! 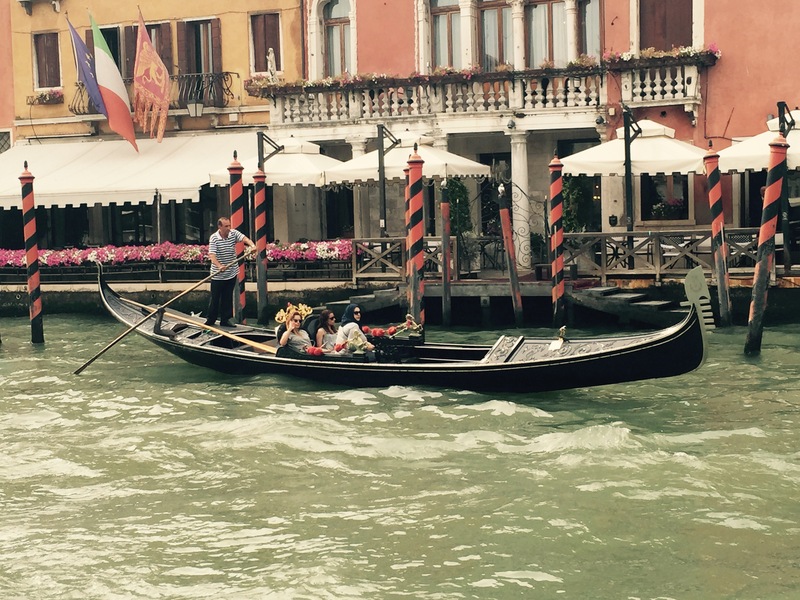 Gondolas: very touristy and very expensive!! You can get a similar experience from the vaporetto rides!! And some streets really could only fit two people standing side by side, and at night everything gets pretty dark and can seem sketch, but I was told they have NO crime, so don’t be scared… (Ew, except for the rats!! Bc of all the water, they have rats, which leads to ppl having cats; some in stores!! Just different, but we only saw a few) You’ll be walking along, and turn down and street and think “this CANT be right!”, and then all of a sudden it opens into a big square!! Venice is made up of over 180 islands, connected by bridges, and divided by canals. The main canal is called the Grand Canal. There is a church in pretty much every square! Pizza is not authentic Italian in Venice bc they’re not allowed to have open flames (wood burning stoves or fireplaces… Or apparently irons, we were told at the hotel!) Traditional Venetian food is seafood and pasta. Masks are traditional in Venice dating back way before Carnivale. Since it’s a small island and everyone lives so close to each other, nobles would wear masks when going to brothels or doing things they didn’t want ppl to know about, sometimes hats and capes. Then commoners started wearing them when they didn’t want ppl to talk to them from home to work. Carnivale is a celebration that, I think started as being 6 months long, where commoners could celebrate and do what they liked, feasting. Now I think it’s just a week, and is a crazy time to visit. But an authentic mask is made of paper mâché, not plastic, and takes a minimum of a week to make, and is at least 20€… “Don’t buy a plastic one, you’re putting ppl out of jobs!” Another bad time to visit Venice, especially if you’re not prepared, is during the “high tide”, which I think is October/November, and possibly again in the spring? The water gets 2-3 feet high, and ppl walk around carrying on business as usual with rubber boots on! Businesses have barricades to block the water from getting in to their shop, and drains to pump out the water, and no living quarters are on the first floor. There is a book shop worth visiting, just north of Rialto bridge area that kept all their books in boats and bathtubs in the store. One year the flood waters got so high, like thigh-height, that all the books were ruined. The shop kept the books and glued them together and made huge stacks and a staircase out of them! Fun sight to see. St Mark’s square– must see the square and the basilica, (it’s a church… You have to have your shoulders covered and most all of your thigh (think, knee-length skirt) to get in, or they make you pay 1€ for a paper shawl, for each your shoulders and knees.. Yes, I looked ridiculous with a burnt orange paper shawl wrapped around my waist!!) the basilica is free, but they charge you for each area you want to go in… The treasury, behind the altar, the balcony… We went to the balcony for 5€, and there’s a gift shop up there. It was worth seeing. The line to st marks basilica is always long, but it moved pretty quickly, surprisingly. Apparently, You can get your ticket online and skip the line. Oh, and anything bigger than a small purse, you have to check at their baggage hold, which is free, but outside and around the corner. (Don’t wait in line with your backpack thinking they’ll let you in!) oh and no pics inside the church, but you can take them from the balcony. It’s only open in the afternoon on Sunday’s, and is really busy in the mornings or weekends when the cruise ships come in! There’s also a clock tower, which has a tour, apparently, but you have to book online, which shows mechanical inner workings of the clock, which is supposedly one of the oldest digital clocks?? It has a regular clock face, plus it reads out the time with numbers in 5 minute increments. There’s also a bell tower, Campanile, right next to the basilica, which has a great view, for 8€, which we went on… Also a line, but moves very quickly… Only cash, and has an elevator. But we were told on our free walking tour (that was three hours, but we stayed for two!) that the better view is on St George’s Island, from their bell tower, which is 6€. 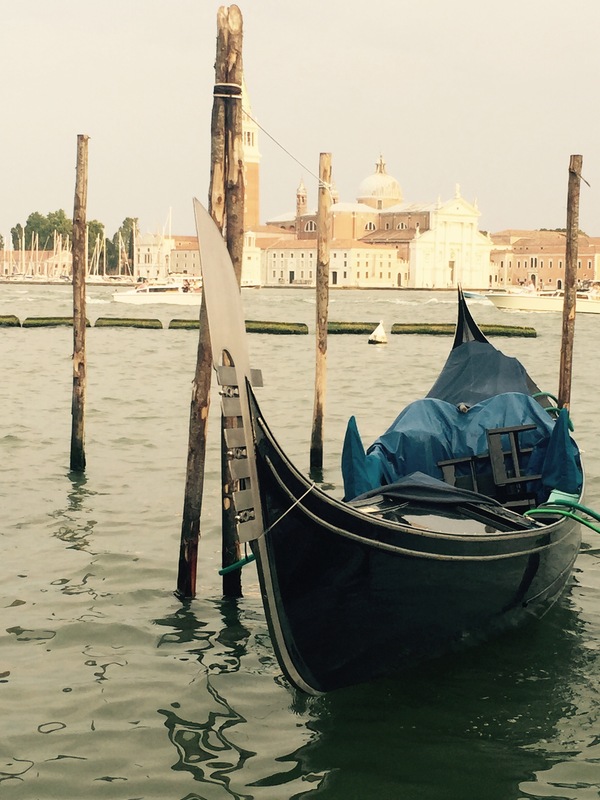 St George’s island is just south of St Marks square; take the #2 vaporetto. Oh, and Doge’s palace, in Italian is Ducale something (that’s how it is on the map, which made it hard to find at first!) I didn’t do this, but Rick Steve’s ranks it a 3 out of 3 on “must-see”, which is what the basilica was. It’s 15€ and gets you a ticket to see it and the museo correr which is located in the north-western part of st Mark’s square. You can buy your ticket there to save you the line at Doge’s palace. Doge is apparently a name for a ruler, and there’s some cool stuff to see, and history, and a Bridge of Sighs. The correr museum is more history stuff. Murano– known for its glass! Take the vaporetto from the north side of Venice, Something Novo (was the station). From the #1 dock (not the #1 vaporetto, but the #1 dock) there, look for the vaporetto that goes to murano. Don’t take the shuttle from your hotel, as I think they make you buy glass from them if they shuttle you out there for free! There are several free glass blowing demonstrations. And TONS of places to buy glass. Don’t buy the cheapest stuff as it’s made in China! lol!! Make sure they can authenticate it… They have stickers… Just ask; and definitely bargain with them! It was notably less touristy here, Read: less crowded. 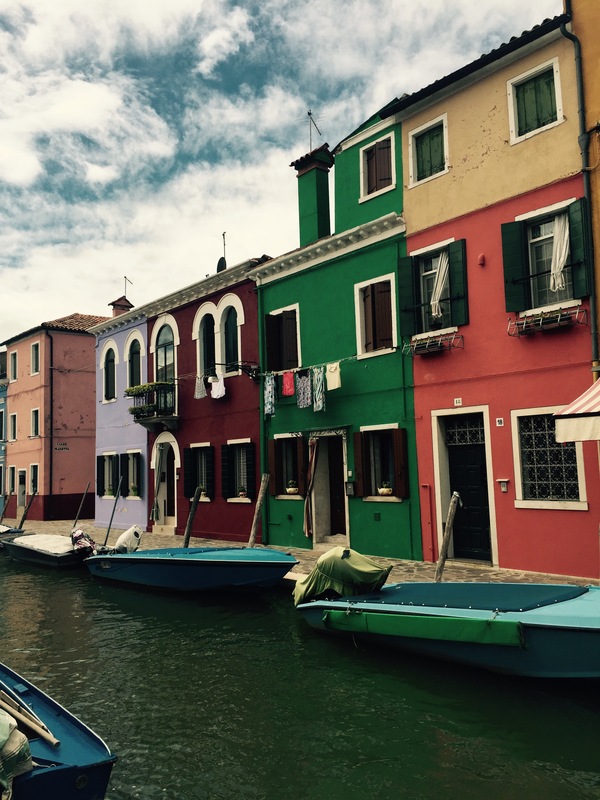 Burano– known for colorful buildings and lace. Takes about 30 minutes to get there from murano!! We saw a free lace making demonstration. The buildings are so pretty and bright, you can’t walk through there unhappy!! Also, way less crowded than Venice. We saw Murano and Burano in about 5-6 hours, but leisurely, and did a lot of walking!! Food– ate the pizza, which is ok, but not authentic (see above). Gelato away from the touristy places. If you go to the counter to order meals or snacks it’s cheaper than if you sit down, which is cheaper than if you eat outside…. This is especially true in touristy places, like St Marks square. The concierge at Hotel Rialto recommended a few places, one was Trattoria Alla Scala. Kind of expensive, but pretty traditional, seafood and pasta. And is close to Hotel Rialto. Our tour guide recommended 5 places to eat, three were nice ($$), and two were cheaper. We managed to find the one near our hotel, veccie poste… “Go over the Rialto bridge and go straight, past a square with a fountain, keep going straight, straight, over a little bridge, where you take a slight left, then straight, and it’s down a little alley/street on the right”. They said if it’s hard to find, you know it’s not touristy! This place used to be a post office, but is now the oldest restaurant in Venice and the fifth oldest in Italy. Drink a Spritz- it looks like DayQuil with an orange in it, but it’s white wine and spirits. If if you drink 2-3 of these and you won’t know what hit you! Trattoria al Madonna. Just the other side of the canal From Hotel Rialto, but down a street, off the canal. Another restaurant recommendation was near that odd bookstore. And the third was next to the dock for the boat to Murano and Burano. There is one hospital in the northern side, it takes up a big part of that district. It’s connected to a church. It has its decorative facade, but the church doesn’t. The facade was/is placed over the bricks, so in case of war/danger/attack, they can remove the expensive facade and only have to repair the brick building part. The hospital has a museum that shows old surgery instruments, for 5€, but wasn’t open on Sunday which was when we were there. The church has, I think, 150 doge’s buried there… They actually had two that you could see entombed… Not sure if they were real, but why would they have fake ones?! Bring: comfy shoes, skirt for churches, purse to carry stuff but not too big, sunglasses, map is a must! And your selfie stick. There are big yellow signs as you get close to the larger areas that say “per Rialto” or “per S. Marco”… Per means “to”, follow those signs!!! Venice was built using tree stumps stuck into the ground, really close to each other, with Austrian stone piled several meters over it, keeping out water and air, allowing the trees to petrify. The island is estimated to flood in 300-400 years due to rising water/sea levels. 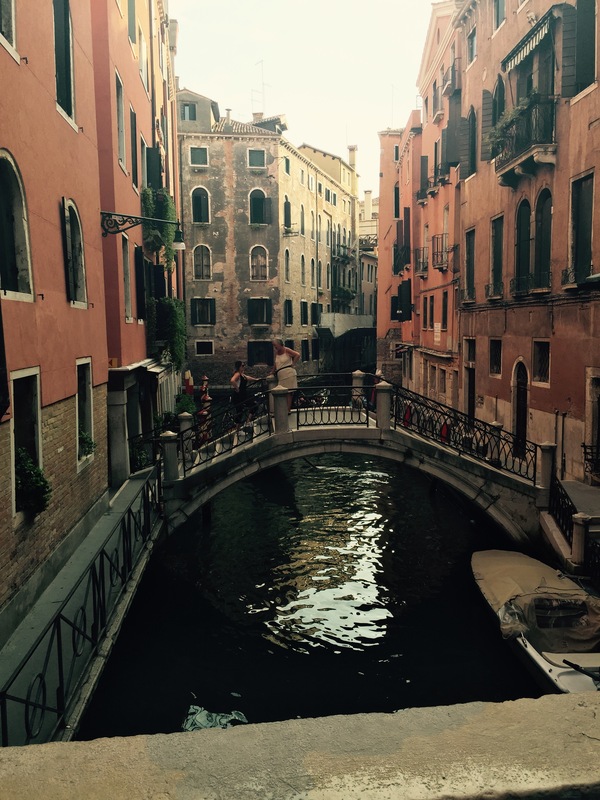 Ask me any questions in the comments… I just loved Venice!! “What’s a “TMJ”?” It’s also known as your Temporal Mandibular joint, where the temporalis bone and the mandible bone come together, otherwise known as your jaw joint. Most people refer to TMJ when they are having a problem with their jaw joint or sore muscles in that area. This is actually called TMJD or Temporal Mandibular Joint Disorder. “How do I know if I have TMJD?” Do you have clicking or popping in your joint? Do you have soreness of your jaw muscles? Do you have a limited opening? Do you clinch or grind your teeth? All of these point to the possibility of TMJD. Dr. Macalik has taken many courses regarding TMJD at the LD Pankey Institute and the Frank Spear Institute. When your teeth don’t align properly it causes your jaw joint to shift to allow your teeth to fit correctly, leaving your jaw joint in a bad position. Over time, this can cause destruction of the jaw joint on one or both sides. Or some people just have a genetical disposition to be “clinchers and grinders”. “What can I do about this?” Well, you need to make sure that your jaw joints and your teeth are protected adequately. The first thing we can do is get you into a well-fitting bite splint to protect your teeth and jaw joints while you’re sleeping and not aware that your clinching or grinding your teeth. A bite splint is actually different than a nite guard in that a nite guard protects your teeth and a bite splint protects the teeth and joints. This bite splint should help to relieve any jaw or muscle pain that you may be having as well. On the rare chance that you have actually deteriorated your jaw bone, a bite splint can help to prevent any further destruction. Most people don’t have a perfectly aligned bite, even if they have gone through orthodontics. Equilibration is a process to balance the patient’s bite to get it to fit evenly and at the same time as the jaw joint is in the correct, seated position. Equilibration consists of shaping teeth by addition or subtraction of tooth structure to allow them to fit correctly. Give us a call today so we can take a look at your unique situation and decide what is best for your teeth and your TMJ! A common question that we hear all the time from patients is just that. Why do I need a crown? Can’t you just fill the tooth? Dental fillings have their limitations. A filling is meant to fill in a hole in your tooth, not to rebuild the tooth structure. A tooth-colored (or composite) filling is bonded to the tooth structure and uses mechanical and chemical retention. The old silver fillings (amalgam fillings) solely used mechanical retention, and their success was based on how much tooth structure was able to support them. A crown helps to hold the tooth together and supports the tooth. A crown preparation removes any decay or fracture lines that weaken the tooth. Then, a lab-made crown replaces the natural anatomical crown part of a tooth. Trying to stretch the limitations of a filling is like trying to spackle a wall back together after a car ran through it!! Dr Macalik always tries to be as conservative as possible and use as much of the viable tooth structure as possible. But there are times when a filling just wont get the job done. This is a question that I often got as I was growing up, as I’ve known this is what I wanted to do since I was twelve. Most people have a fear of the dentist. I think this comes from not understanding what’s going to happen at each visit, or possibly a bad experience in the past. The dental chair really is a vulnerable position to be in. I have that same fear when sitting in the dental chair as well, but for me, the desire to become a dentist came from my orthodontic experience when I was younger. My orthodontist was so kind and patient and always encouraging. They would always answer my questions about the stages and processes. I, in turn, enjoyed my experience with braces! This is my goal for each and every patient that walks through my door. I want to help them restore their teeth to a level of health and then maintain it, and I want to explain and answer any questions they have along the way. I love being able to alleviate the fears of patients, and the best compliment that we receive is when a patient says, “Was that it? That didn’t hurt at all!!”. We aim to go the extra mile for our patients to make them feel how much we care about them. Our office provides a number of amenities for helping patients to relax during their visits ranging from blankets and eye masks to headphones and iPods to nitrous oxide to help patients relax. We even offer some forms of sedation dentistry. Before you go swearing off dentists, give our office a try. We’d love to be able to dispel another myth that the dentist is a scary person!